Therefore, spherical roller bearings are suitable for low/medium speed applications which involve heavy or impact loading. They come with cylindrical or tapered bores and can be supplied with adapter assemblies as well as withdrawal sleeves. These bearings are divided into R, RH(R) and RHA types, which differ in internal structure. Bearings with a tapered bore can be fit and removed easily using an adapter assembly or withdrawal sleeve. Others: 1:12 (supplementary code “K”). 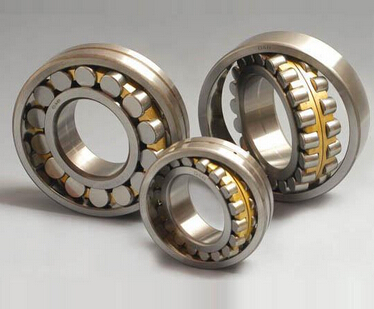 Spherical roller bearings are available as double-row, combination radial and thrust bearings. They use a spherical or crowned roller as the rolling element. The race in the outer ring is spherical in shape, which allows for some misalignment of the shaft and the housing. Spherical roller bearings are unequalled in their capacity for high loads and their tolerance to shock loads, but have limited speed capabilities. They perform consistently, even under extreme conditions, such as application-specific stress and marginal lubrication. The cage of a spherical roller bearing provides high dimensional accuracy and functionality. According to some estimates, spherical roller bearings have twice the running life of conventional bearings. 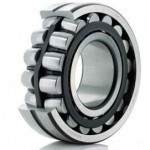 Most spherical roller bearings are made of alloy steels or low-carbon steels. Chrome-plated products are also available. Some applications require the use of case-hardened or through-hardened, high-carbon, bearing-quality steel. High-carbon grades of steel do not require carburizing and can be case-hardened by induction heating or through-hardened by conventional heating methods. When low-carbon, carburized grades of steel are used, carbon is introduced after the spherical roller bearings are machined to a depth sufficient to produce a hardened case that can sustain bearing loads. The addition of carbon and alloys ensures the proper combination of a hard, fatigue-resistant case and a tough, ductile core. Bore size and outside diameter (OD) are important specifications to consider when selecting spherical roller bearings. The bore size is the bearing's smallest dimension. The outer diameter includes the bearing housing, but excludes the flange. Other important specifications for spherical roller bearings include overall width, rated speed (oil), static axial load, static radial load, dynamic axial load, and dynamic radial load. Static axial and static radial loads are, respectively, the maximum axial and radial loads that bearings can withstand without permanent deformation. Dynamic axial and dynamic radial loads are, respectively, the calculated axial and radial loads under which a group of identical bearings with stationary outer rings can endure for a rating life of 1 million revolutions of the inner ring. Machined bronze retainer which is ideal for higher speed operation and ensures better performance under marginal lubrication conditions. Symmetrical roller design (RH Type Spherical Roller Bearing) with two rows of longer symmetrical roller and only a center guide ring instead of a rib. Self-alignment feature accommodates up to 2 misalignments.